The scripture module of RESource assists Religious Education teachers (Years 7–10) to find reliable online resources to help them prepare and present lessons and lesson sequences in the study of scripture. It follows a logical progression in the study of scripture and its application to life. The study of Scripture does not have cognitive learning as its sole end because Scripture is the word of God, always ‘alive and active’ in the context of the community of believers that is the Church. The Scripture module opens with a brief visual résumé of salvation history. It moves from the mystery of the origins of the world in the creative word of God, through the history of the Chosen people of Israel, to the revelation of the word made flesh in Jesus Christ and the ‘turning point of the ages’, his death and resurrection. The final frame of the introductory presentation reveals two icons, which represent the Old and the New Testaments. Clicking on these will open either the Old Testament arena or the New Testament arena. Within each of the arenas a range of texts are assembled. Some of these are centred on whole books of the Bible, for example the Gospel of Mark. Others concentrate on a section of a book in the Bible, for example Genesis 1 and 2. This section explores the geographical, historical, cultural and religious setting of the text. It refers to materials in Core Resources, but also draws attention to sites of specific relevance to the text under study. This section takes a close look at the text itself: the genre, the author, approximate dates and the community setting from which the text may have emerged. It recommends sites which discuss these issues. This section encourages contact with the text through study and prayer. It makes recommendations about online versions, commentaries, outlines and studies of the particular text, which provide insights into its themes, structure or teaching. Where possible it also directs readers to prayer sites connected with the text. This section examines the effect that the text has had on its hearers over the ages. It points readers to sites that contain the stories of saints and leaders moved to action/contemplation in response to the biblical text, as well as the stories of some present-day people similarly moved. It also directs readers to art, music and drama sites that show a creative response to scripture, before inviting a personal/class response. While an increasing number of Internet sites for the study of scripture provide access to excellent online learning, these are still far outnumbered by sites which, while usually well intended, are of dubious value for the classroom. It is important, therefore, when using the Internet to be careful in selecting sites, to ensure that an evaluation of their authenticity, reliability and quality has been undertaken prior to their use as a resource. The Internet for Religious Studies site has a fine section advising Internet users on ways to identify reliable sites. In addition, it is advisable to read some reputable print commentaries or introductions to the scripture you will be teaching. This is important because it will familiarise you with the subject matter of the text and some of the critical questions around it. Moreover, reputable books on scripture go through a process of screening, editorial comment and correction that websites do not, so reading some good introductions or commentaries will give you some basis on which to judge online resources. It is not sufficient to read ‘devotional’ introductions. These are suitable for prayer but not as an introduction to study. Discussion with colleagues who are experienced in teaching scripture is also invaluable. directions to online responses to scripture in the arts and media. Each topic opens with a ‘trailer’ emphasising some key points of the chosen text. This may form a basis for introductory stimulus in the classroom or may help in devising revision activities. This section explores the geographical, historical, cultural and religious setting of the text. It refers to materials in Core Resources but also draws attention to sites of specific relevance to the text under study. The University of Michigan site has the Revised Standard Version of the Bible online, enhanced by an efficient search engine that allows you to search by book, chapter or verse, as well as by individual words and phrases. This makes it an effective concordance. This is the version usually referred to in RESource. Other translations and versions are referred to in relation to particular areas of Scripture Studies. If you are studying Old Testament texts you might like to look also at the translation of the Old Testament (or Tanakh) provided on the Jewish Virtual Library site. Another Jewish site Navigating the Bible contains the text in Hebrew and English, together with a dictionary of people, places and things. In the area of New Testament studies, Dr Mark Goodacre of the University of Birmingham has organised a fine gateway site that contains excellent and reliable links, to many articles and websites, some scholarly, some popular. Electronic New Testament Educational Resources organised by Professor Felix Just SJ also provides many links to reputable sites. The Narrow Gate is a fine teaching resource prepared specifically for high school use. The Old Testament Gateway is not as extensive nor as authoritative as Dr Mark Goodacre’s New Testament Gateway but it contains some worthwhile introductory articles and essays on specific topics. There are a couple of excellent general Old Testament sites on the web. One of these is Barry Bandstra’s introductory site Reading the Old Testament- An Introduction to the Hebrew Bible. The other is an introduction to the Old Testament in point form prepared for his high school classes by teacher Richard Martin. This site, also mentioned above, is called The Narrow Gate. It includes model quizzes and crosswords designed to help students read texts closely. Scroll down the list of contents to the Old Testament section. A short article entitled How the Bible was Written provides a good brief introduction to the background, composition and development of chiefly Old Testament texts though the New Testament is touched on too. There are almost no up-to-date, scholarly dictionaries of the Bible online. However, one, which provides brief definitions, is Tim Bulkeley’s Hypertext Bible Dictionary. Along somewhat similar lines is A Basic Vocabulary of Biblical Studies For Beginning Students. Finally, a comprehensive map resource for both Old and New Testaments is the Online Bible Atlas. It provides detailed maps of the near East including annotated maps of the movements of Jesus as recorded in the gospels. Other maps set out the geographical and political situation of the time and provide a wealth of background information about the first century setting. Photo essays and galleries help bring maps alive. At least two comprehensive collections of photographs of biblical regions and locations can be found on the Net. One is the Biblical Places site, which has the added advantage of a collection of related links at the end of each gallery. The other is Holy Land Photos, which covers 160 sites and contains over 1600 photographs, most with commentaries. The Franciscan Order, custodian of many significant locations in the Holy Land, has an informative though densely written site describing many of the places associated with Jesus’ ministry especially Capharnaum. A very attractive site Journeys of Paul provides an illustrated tour of many of the cities visited by Paul during his great first century missionary effort. The Jewish Roman World of Jesus contains several articles which explore the society into which Jesus was born and from which the Christian scriptures emerged. Some of the articles are quite academic in tone, others very approachable and easily understood. A site which provides much background detail to New Testament times is A Portrait of Jesus’ World. Romans, Greeks, and Jews: The World of Jesus and the Disciples is useful because it explains how difficult it is to be free of twenty-first century preconceptions when reading the scriptures. A simple introduction to the cultural setting and daily life in the time of Jesus can be found on the Loreto Normanhurst site. This site is visually engaging in its own right (though some sections, disappointingly, are not fully developed yet) and has a good set of links to other sites dealing with aspects of life in biblical times at a level easily accessible to junior secondary students. Factions at the Time of Jesus gives a brief outline of various religious groups influential in Israel in Jesus’ time. A slightly more detailed introduction to significant Jewish groups in First Century Palestine is provided on the E.N.T.E.R site. ‘Gospel’ is an English translation of the Greek word euangelion which means ‘good news’ (eu –good + angelia – message). The literary term euangelion existed in the Greco-Roman world. It referred to lives of important figures written down to praise their ancestry or achievements. The Christian literary form known to us as a ‘gospel’ is a particular way of writing which seeks to set out and explain the life, death and resurrection of Jesus Christ in such a way that those reading it are moved to faith in him, and also to provide believers with a pattern for living according to the way of Jesus. The earliest use among Christians of the word ‘gospel’, and examples of ‘gospel’ writing, are to be found in Paul’s letters (e.g. Romans 1:1; Romans 1:16; 1 Corinthians 15:1-5) where he writes of the good news of Jesus’ life, death and resurrection in letters to communities of early believers. But the form which is most familiar to us is exemplified by the four gospels of Matthew, Mark, Luke and John. A gospel is not a biography nor a history in the usual sense (though the gospels arise from the actual life of Jesus of Nazareth, who lived and died in first century Palestine). The four gospels are efforts by four early Christian writers to capture something of the immensity of the experience of the life and death of Jesus and its meaning and to set it down for the sake of the communities of believers in Jesus. Three of the gospels, Matthew, Mark and Luke are often referred to as the synoptic gospels because they present a somewhat common view of the ministry of Jesus, though each of their portraits of him also has special particular emphases. John’s gospel is conceived of quite differently, though it also includes material about Jesus which is part of the synoptic accounts. The portrait of Jesus that emerges from all four gospels is consistent, cohesive and impressive, despite the different authorship and traditions surrounding each gospel and the many discrepancies in detail that occur in the texts. An explanation of why discrepancies occur in the gospels based on the life of one person can be found on the Xenos site. Christians believe that the gospels like the rest of the Bible are the inspired word of God and that when the scriptures are read and proclaimed God speaks to us through them. At the same time the Church acknowledges that God works through human beings, human experiences and even through human limitations and also through the Church itself inspired and led by the Holy Spirit. It is important to remember that inspiration concerns the ultimate origins and authority of the biblical texts, not facts about their composition. Cultural limitations, discrepancies and mistakes in the texts do not compromise the word which God speaks to human beings through them. The texts which proved most valuable to the Church in mediating the life of Jesus to the Church were eventually chosen as the authoritative books or canon of Christian scripture. This took quite a long period of testing and choosing. Though the canon of the New Testament was substantially established by the year 200, it was not finalised until the end of the fourth century. These texts continue to shape what Christians believe about Jesus and how they understand life and its ultimate meaning, in the light, not only of his teaching, but also of his death and resurrection. It is the faith of the Church that everything needed for the knowledge and love of God in and through Jesus Christ is contained in these human but divine documents. So on the one hand we seek to discover all we can about the human story of these ancient documents – how they came to be written, their authors, background and human origins – and on the other we seek to discover their deeper or ‘divine’ meaning. We seek especially to discover how Jesus is personally and communally alive to ourselves and to millions upon millions of believers through the living words of the New Testament. In an interview, scripture scholar Luke Timothy Johnson calls this ‘learning the living Jesus’. Professor Felix Just SJ has a very helpful collection of Church documents which relate to the interpretation of scripture in the Church. As well as the full texts of various documents there are a couple of summaries which can help you grasp the main points. A further edition of the document entitled The Interpretation of the Bible in the Church is worth checking because it is well set out and divides the document into manageable sections. Study of these documents is worthwhile, so that you understand the difference between the Church’s interpretation of scripture and the fundamentalist approach. Fundamentalism of all kinds is big news at present. In this article on biblical fundamentalism, Fr Raymond Brown explains why a literalist interpretation of the Bible is a distortion which leads to misunderstanding and even to loss of faith. He suggests ways of thinking and speaking about scripture in a more authentic way and concludes his brief article with ten possible responses to ten questions often put to Catholics by Biblical fundamentalists. Biblical exegesis sounds solemn and complicated but it really is simply the close study of sections of scripture in order to understand their message more clearly. Secular scholars study the Bible as a collection of ancient documents that can be of great help in understanding human history. But religious scholars, while profiting from everything that close study can reveal about people and places in the Bible, are concerned most of all to understand the religious significance of the text. A helpful site for teachers who want to familiarise themselves with the aim and a method of biblical exegesis is Richard Ascough’s A Guide to Biblical Exegesis. Here you will find a good simple definition of biblical exegesis and a straightforward three–step method. Another more detailed Australian site provides a very useful method of approaching biblical texts and good questions to bring to an examination of scriptural passages under study. It is vital to obtain access to print copies of dictionaries and commentaries because with one or two exceptions, Web dictionaries and commentaries on the Bible are either very outdated or provided by unreliable sources. An attempt to create a concordance of artworks relating to particular texts of the gospels has been undertaken on the Textweek site. A variety of art is presented, including black and white woodcuts, renaissance works, 19th century devotional art, some icons and examples of African mafa art. The depictions are by no means of equal artistic merit but the range and contrast offer teachers another way of introducing and speaking about particular extracts from the gospels. The Textweek site also provides an annotated list of films which examine various themes suggested by scripture and could help teachers make connections between scripture study and life. Art and the Bible, suggests ways in which we learn about scripture non-verbally. It contains many links worth exploring: to art, stained glass and clip art sites. A particularly good clip art site is Hermanoleon which provides images to match the readings of each Sunday of the Liturgical Year plus many connected with the sacraments and devotions of the Church. Washington State University has a valuable introduction to Hebrew civilisation called ‘Questions about the Hebrews and Judaism’ which gives a broad introduction to the religious genius of the Jewish people as well as providing much historical and cultural background. The site traces the development of the Hebrew understanding of God from very early times during which it was beginning to differentiate itself from other ancient, near–eastern religions and religious practices up until the period immediately prior to the beginning of the Christian era. ‘Israel’ provides a brief definiton of the history of the country of Israel from the time of Jacob through to the creation of the modern state of Israel in 1948-1949. It includes a visual timeline and basic maps. A more extensive discussion can be found at ‘History of Israel’. The Historical Context of the New Testament sets out some details of the political and social setting of first century Palestine and discusses the three major forces that were at work, contributing to and shaping the world into which Jesus came and in which the NT was written: Greek culture, the Roman Empire, and Jewish religion. As Paul tells it … continues this discussion while a New Testament Chronology provides an idea of dates and events mentioned in the New Testament as well as some key historic happenings. The Geography and People of the Bible World site gives a brief introduction to the main geographical features of the section of the Near East in which the Biblical narratives take place. Photographs and maps of places of significance in the Bible can be viewed on the Biblical Walks. The detailed online Bible Atlas is very useful for an understanding of the geography of the Holy Land while a chapter on ‘The Land’ by Gerald Larue is another handy though slighly dated, introduction to the significance of the physical character of the land of Israel to its history. There are a couple of excellent general Old Testament sites on the web. One of these is Barry Bandstra’s introductory site Reading the Old Testament–An Introduction to the Hebrew Bible. The other is an introduction to the Old Testament in point form prepared for his high school classes by teacher Richard Martin. It also includes model quizzes and crosswords designed to help students read texts closely. The name of the site is The Narrow Gate. Scroll down the list of contents to the Old Testament section. A short article entitled How the Bible was Written provides a good brief introduction to the background, composition and development of Bible texts. This section is yet to be developed. Meanwhile see Reading the Old Testament Part 1 Torah. Moses is counted the first and greatest of the prophets because, as no other and none since in the history of Israel, he spoke with God and acted as intermediary between God and the people to bring them out of slavery and into the Promised Land. The story of Moses is conveyed in the Books of Exodus and Deuteronomy and Numbers, which are three of the five books of the Jewish Torah (see above). Prophets on Barry Bandstra’s ‘Reading the Old Testament’ site gives a good introduction to the prophetic books. Bandstra distinguishes between the popular understanding of the words ‘prophet’ and ‘prophecy’ and their biblical meaning and he gives examples of people of our own time whose words and actions might qualify them to be regarded as prophetic. Since the time of Moses others have been recognised as prophets –spokesmen for God and intermediaries with the people. Joshua, some of the Judges and Samuel are among these. They are briefly identified on the Jewish OHR site. The stories of the former prophets are also referred to as the ‘deuteronomistic history’ because they reflect the concerns of the authors of the book of Deuteronomy who were anxious to show how the hand of God was at work in the unfolding history of the people of Israel. Another site which introduces the former prophets succinctly is Richard Martin’s The Narrow Gate. A bridge between the ‘former prophets’ and the ‘classic’ prophets (those who have left a written tradition) are the figures of Elijah and his successor, Elisha. Their stories are told in the book(s) of Kings. They take the role of the prophet beyond either the prophetic function associated with leadership, for example, Moses and Joshua, or the ‘king-maker’/advisory role of prophets such as Samuel and Nathan. Elijah and Elisha become public religious figures whose role is to challenge the nation and especially its political and religious leaders to fidelity to God and the ancient covenant. 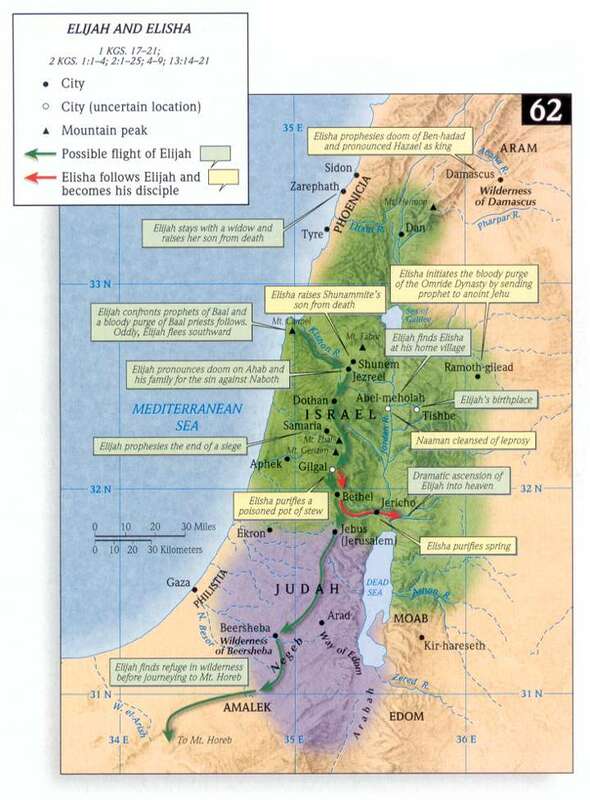 A map outlining the extent of the activities of Elijah and Elisha helps to give an appreciation of their special role. The classic or ‘literary’ prophets are those prophets whose prophetic words and actions were recorded and written down: these prophets are Isaiah, Jeremiah, Ezekiel and the twelve minor prophets. Either they themselves or their followers wrote down and elaborated their prophetic oracles or actions and these writings were edited and incorporated into the Jewish Scriptures or Tanakh. The prophets and their messages were crucial in recalling the people of Israel to fidelity to God. They shaped a religious understanding that calls human beings away from idolatry, violence and exploitation to love of God expressed through love and service of others, especially those in any kind of need. The fact that their rebukes and criticisms of Israel were accepted into the sacred scriptures of their people shows that, despite the treatment meted out to them in the course of their ministry, their message was recognised as God-given. This section is yet to be developed. Meanwhile see Reading the Old Testament: Part 3. A very simple method of praying with a scripture passage is suggested in the document Praying with scripture. Alternatively a short article on Lection Divina from St Mary’s Press could help you introduce this ever ancient, ever new way of praying to your class. A further introduction to Lectio Divina shows how it can be used not only by individuals but also in a group situation could be helpful in the context of school retreats or from time to time in the classroom.Another fine site which sets out a daily way of praying with scripture based on St Ignatius’ approach is the Irish Jesuit site Sacred Space. See the article Hearing the Word of God for a brief discussion of the significance of scripture within Christian liturgy – the communal worship of the Church. A slightly longer article Doctrina Liturgica looks at how scripture underpins the whole movement of the Christian year. Professor Felix Just SJ has a very helpful collection of Church documents which relate to the interpretation of scripture in the Church. As well as the full texts of various documents there are a couple of summaries which can help you grasp the main points. A further edition of the document entitled ‘The Interpretation of the Bible in the Church’ is worth checking because it is well set out and divides the document into manageable sections. Study of these documents is worthwhile, so that you understand the difference between the Church’s interpretation of scripture and the fundamentalist approach. A very good overall introduction to the life and work of Paul writer of so many of the New Testament letters is In the Footsteps of Paul which introduces the apostle and the first century world in which he lived.